So yeah, my health has not been great lately! The cold I had that turned into a sinus infection, came back last week. Just when I thought I was feeling better and ready to get back at things I felt like I was WORSE. I went back to the doctor after spending an entire night up with a sore throat and she tested me for strep (negative) and made sure I didn’t have pneumonia. She said that it could either be viral, and in that case the antibiotics I took didn’t work (they didn’t work, and usually they kick in pretty fast when I take them) or I didn’t take the antibiotics long enough. She said that they used to prescribe them for 10 days but recently changed that to the standard being 5 days (which is what I took) and that’s often not long enough. So lucky me, I got a second round of antibiotics–and a different kind. This time for 10 days. Ugh. I am so over it! By Friday I was feeling a lot better and I even went for a swim. I was able to swim like normal and didn’t feel like taking 2 weeks off made it a tortuous activity. On Saturday I slept in really late (like seriously late, 10:30!) and then went to the gym. Since my back is still in recovery I’ve been taking a break from weight lifting. But the last physical therapy session she gave me the okay to do SOME. No squats, nothing that could aggravate my back but things like biceps, triceps, chest press, etc, could potentially be ok. 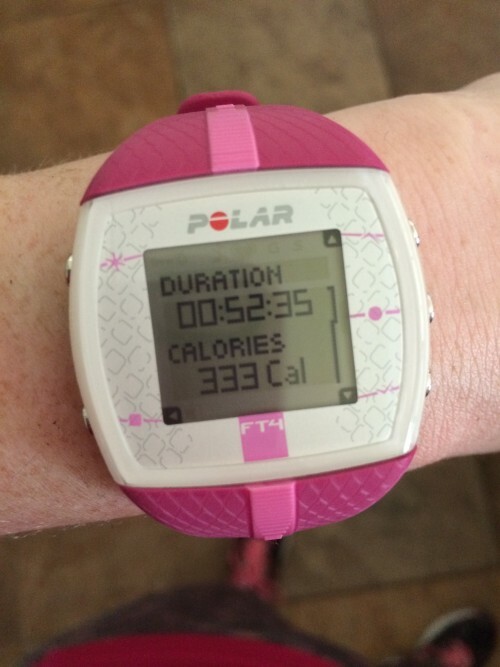 I did a minimal weight lifting session and then ran/walked 2 miles on the treadmill. 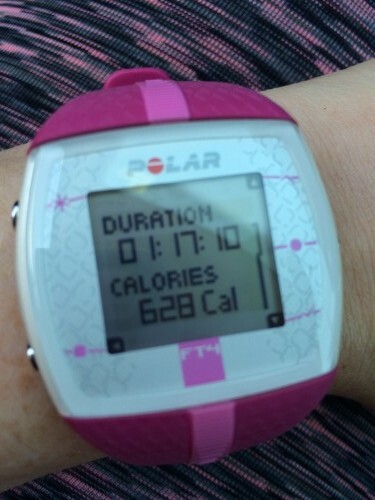 I can tell that I’m still not 100% recovered because that calorie burn is pretty high for what I did. That’s the norm when I am sick–my heart rate is higher and I get worn out easier. I was feeling pretty good and energized, though. It was such a nice day that I decided to do some work in the yard. 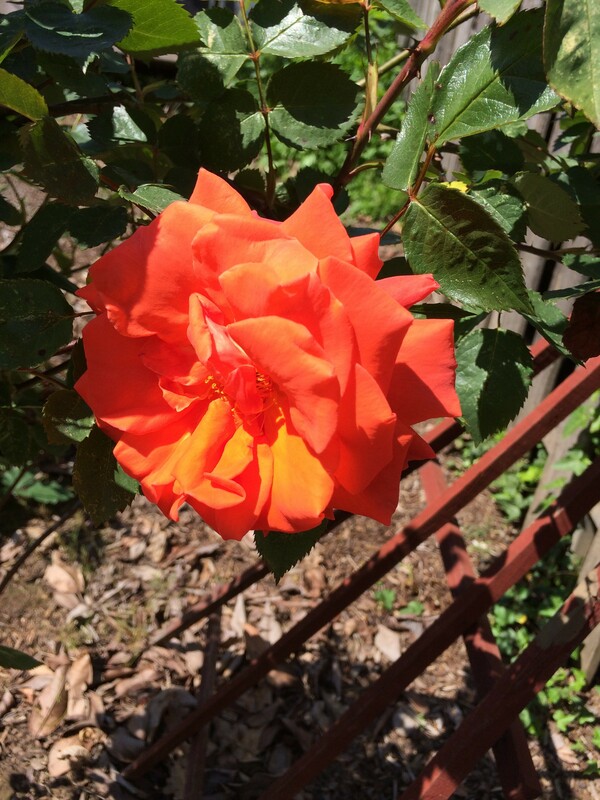 I pulled weeds, trimmed back some of the blackberry bushes and then discovered that the rose bush I planted last year was actually blooming! I always forget just how much work it is. The day was filled with chores and errands and grocery shopping but it was so nice that we wanted to enjoy the weather and BBQ. So we invited some friends over for dinner. 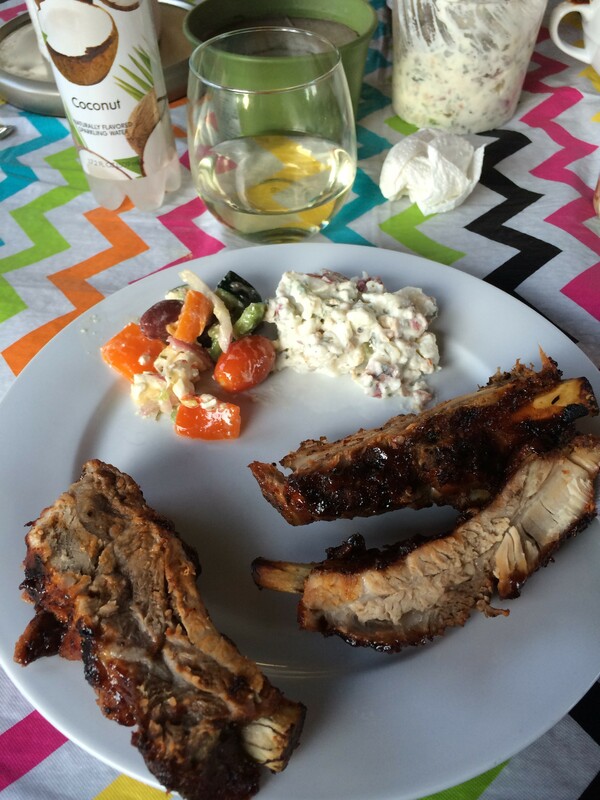 Michael picked up some pork ribs from Costco and got busy grilling. 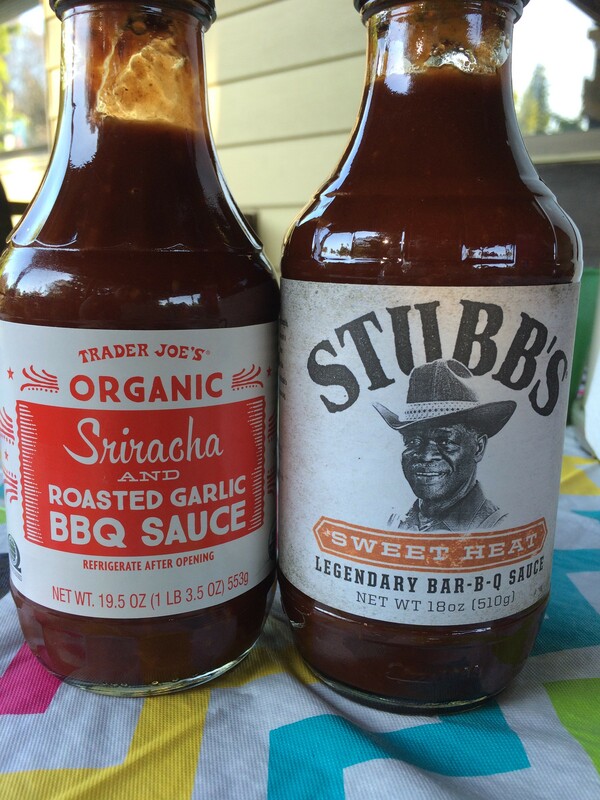 I bought some BBQ sauce at Trader Joe’s that you MUST BUY ASAP! The Sriracha and roasted garlic sauce is AMAZING. So so good. It might be my new favorite BBQ sauce. I can’t imagine using another one after trying this one. Our friends brought the side dishes: some raw veggies and hummus, a mediterranean vegetable salad and a delicious bleu cheese and bacon potato salad (that was so good). I had some wine with dinner and we relaxed outside on the deck in the nice weather. It was the first grilling of the season! I can’t wait for summer. I had three ribs and a little too much of that amazing potato salad. On Sunday I woke up and was feeling the weight lifting and gardening I had done. Boy howdy was I feeling it. Thankfully none of it was PAIN and I didn’t aggravate my low back. But I was incredibly sore and feeling it. I knew the perfect remedy/activity for a sore body: hiking in the sunshine!